Whatever kind of blade you use for cutting, will at some point become blunt, making it harder to slice through of even score. A blunt knife tip can easily ruin your work by ripping or tearing rather than neatly slicing. Having to buy new blades on a regular basis can be very costly, so resharpening your worn or damaged blades is a great way to save you time and money. Sharpening a blade back to it’s manufacturers original finely honed tip using an oil stone could be recognised as an art form on it’s own. Never try to resharpen the cutting edge of a blade as you are more likely to ruin it rather than repair it and it could become dangerous to you and your chosen work material. Remembering that your cutting blade or knife edge has been produced by some finely tuned machinery, so the key is to keep as much of the original edge as possible and here’s how! 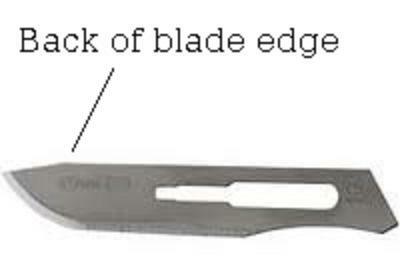 If your blade is seriously blunt, you need to start by using a coarse material to regrind the cutting tip. My favourite is a common paving slab that I have in my garden. If able, take a seat on the floor so you are closer to the ground. Now make sure your blade is set tightly in it’s recommended handle, (never try to cut with or sharpen a lose blade), and look at the back edge of the blade as this is what we will be regrinding. Hold your knife at a slight angle in a comfortable manner with the back of the cutting edge facing the ground. Firmly drag the knife backwards to the side of you (never forwards as will tend to chip the blade) around a dozen times across the ground and inspect it. Wipe away any dust then check out your newly ground cutting tip. This will have created a brand new blade at no cost! For finer work like paper, you will need to remove the roughened edge using a sharpening stone or fine metal file to create a super strong and safe to use pointed tip. It shouldn’t take more than a minute to recycle an old blade into new and could give you many hours of use! Basic paper crafting doesn’t need much more than a pair of scissors and your design, drawn or ideally printed on it so that you can carefully cut it out and add glue to stick it together. PVA glue is safe, strong, dries clear and dries fast. A steel rule is used for a perfect straight line. Plastic and wooden rulers are too soft and you could cut into the ruler and ruin it and your work. Scissors are useful for cutting out larger waste paper pieces. Tweezers are good for picking up small pieces and will even help with creating smaller folds.